Koi and goldfish have plenty in common. Their feeding needs are about the same, as are their breeding habits. Both are popular fish for stocking outdoor ponds, and both can be kept indoors. Koi will end up costing you more money, though. Not only do they require filtration systems for the water, they can be priced in the thousands of dollars, whereas goldfish may cost $5 to $50 or even just a little change. They may seem identical, but they have plenty of differences. Goldfish can display coloring besides the familiar golden orange. Goldfish can be black, red, white or a combination of these colors. In his book "Goldfish: Your Happy, Healthy Pet," Dr. Gregory Skomal noted that koi have coloring very similar to that of goldfish, but the patches of contrasting color they display tend to be larger than those of goldfish. Many of the physical characteristics of a fish will help you determine whether you're looking at koi or goldfish. Their dorsal fins differ. Starting at the top, the dorsal fin of the koi is curved out; it's curved in on the goldfish. If that isn't obvious enough, consider the whiskers. Koi have barbels around their mouths and chins, feelers that resemble whiskers, while goldfish have no barbels. The body shapes and sizes of the two fish differ, too. Fully matured goldfish are typically 8 to 12 inches, growing to 16 inches at their largest. Koi that size would be considered very small, as they grow to full sizes of 18 inches to 4 feet. As for body shape, koi are shaped essentially the same; goldfish, on the other hand, can have different tail and body shapes and may have one of three different eye types. Goldfish have been kept as pets much longer than koi have. Around 11 A.D., people in southern and central China began breeding them for their beauty and the tranquility and harmony they engender. Koi were initially kept as a source of food because they were easy to raise and care for. Koi farming started in the 1820s in northeastern Japan. 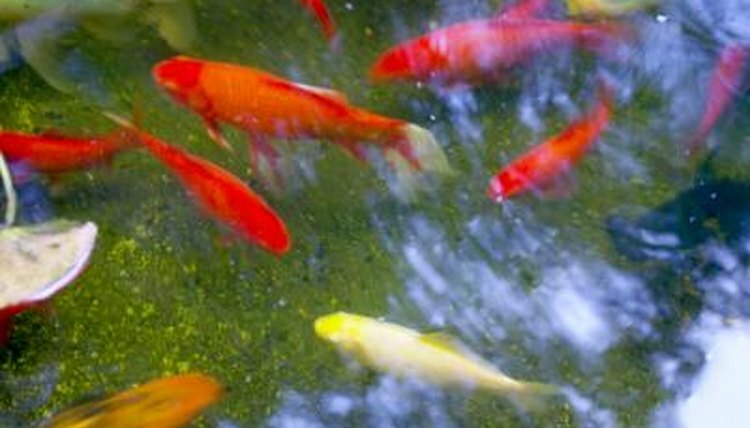 Both types of fish can be kept in outdoor ponds or in tanks indoors. The biggest difference in keeping koi is that they need aeration and filtration, and enough room to stay happy and healthy. Stephen Meyer of FishChannel.com recommends planning for 100 gallons for each 12-inch koi you want to keep, but the number you can keep per every 100 gallons of water decreases as their sizes increase. If, for instance, you will be keeping 6-inch koi instead of 12-inch, Meyer advises nine of them will do fine in the same 100 gallons of water required for one 12-inch fish. Goldfish do not have the aeration and filtration requirements that koi do, and the calculation for figuring their water volume needs, whether in a pond or a tank, is based on weight rather than length. For both types of fish, it's absolutely necessary to change the water weekly if you'll be keeping them indoors in a tank. Goldfish: Your Happy, Healthy Pet; Gregory Skomal, Ph.,D.